In Aerodium – the first vertical wind tunnel in the Eastern Europe – you break away from gravity and in the age of technologies allow your body to fly by itself! Aerodium is a unique entertainment for those seeking new emotions, for companies of friends, families, corporate events, as well as the place for training sessions of professional athletes. 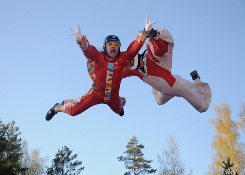 An airborne person, not tied by any ropes or parachutes – that is flying in the most direct meaning of the word. The strong air flow in the Aerodium wind tunnel allows you to lay on it and glide in the air. By changing the position of the body, the laws of aerodynamics will allow you to fly up, perform the most varying movements, acrobatics, and feel unbelievable emotions. You think that you cannot simply arrive and fly? Yes, you can! In order to fly, you don’t need previous experiences – you will be fully equiped and prepared for the flight by Aerodium team. 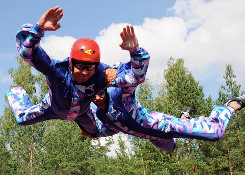 Before the flight, you will need to take a 30-minute preparation course, where you will be trained and provided with the necessary gear – the outfit, goggles, helmet, and gloves. Then, together with the instructor, you will go to the wind tunnel, where the created air flow with the speed of nearly 200 km/h will lift you up in a free flight. If necessary, the instructor will provide you with constant support during the flight. For flying, you should wear light clothing, in which you feel comfortable and which allows freedom of movement. It is a must that your footwear has a flexible sole, however it cannot be sandals or shoes with open toes, – the best would be snugly fitting sports shoes. To get closer to achieving your dream of flying, you should be in a good physical health, aged from 5 to 75 years, weighing from 20 to 100 kilograms, not taller than 2 metres. Please contact us info@grandbaltics.com to book Aerodium Flight in Latvia.